This rear extension was one of the elements of a major remodelling of a mid-terrace house covered in the loft projects. The client wanted the rear extension to extend the kitchen giving a large family room and provide seamless access to the garden. 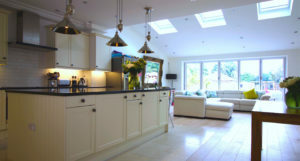 The result is a large kitchen diner and family room flooded with natural light. A resounding success for the client and highlighting EB’s passion for perfection.